The treaty was fathered by Parliament Speaker Hussein El-Husseini and negotiated in Ta'if, Saudi Arabia, by the surviving members of Lebanon's 1972 parliament. The agreement came into effect with the active mediation of Saudi Arabia, discreet participation by the United States, and behind-the-scenes influence from Syria. The agreement covered political reform, the ending of the Lebanese Civil War, the establishment of special relations between Lebanon and Syria, and a framework for the beginning of complete Syrian withdrawal from Lebanon. Since Rafik Hariri was a former Saudi diplomatic representative, he played a significant role in constructing the Taif Agreement. It is also argued that the Taif Accord reoriented Lebanon toward the Arab world, especially Syria. In other words, the Taif Accord positioned Lebanon as a country with "an Arab identity and belonging." The agreement was finalized and confirmed only after the development of an anti-Saddam Hussein international alliance. The alliance included Saudi Arabia, Egypt, Syria, France, and the United States. On the other hand, the agreement also gained the blessing of the Islamic Republic of Iran. Therefore, it collectively and internationally supported for Syria's guardianship over Lebanon. The agreement formed the principle of "mutual coexistence" (al 'aysh al-mushtarak) between Lebanon's different sects and their proper political representation (sihat al-tamthil al-siyasi) as the main objective of post-civil war parliamentary electoral laws. It also restructured the National Pact political system in Lebanon by transferring some of the power away from the Maronite Christian community, which had been given a privileged status in Lebanon under the period of French rule. Prior to Taif, the Sunni Muslim Prime Minister was appointed by and responsible to the Maronite President. After Taif the Prime Minister was responsible to the legislature, as in a traditional parliamentary system. Therefore, the agreement changed the power-sharing formula that had favoured the Christians to a 50:50 ratio and enhanced the powers of the Sunni Prime Minister over those of the Christian president. Prior to the Taif negotiations, a Maronite Christian, General Michel Aoun, had been appointed Prime Minister by President Amine Gemayel on 22 September 1988. This had caused a serious political crisis of a split premiership, as the post was reserved for a Sunni Muslim due to the National Pact of 1943, and Omar Karami held this office. Taif helped to overcome this crisis by preparing the election of a new president. The agreement also provided for the disarmament of all national and non national militias. Hezbollah was allowed to stay armed in its capacity as a "resistance force" rather than a militia, fighting Israel in the south, a privilege obtained – according to the Swedish academic Magnus Ranstorp – in part by using its leverage as holder of a number of Western hostages. As of March 2018, Hezbollah remains armed and in control of the area after Israel withdrew from southern Lebanon in 2000. Although the Taif Agreement identified the abolition of political sectarianism as a national priority, it provided no timeframe for doing so. The Chamber of Deputies was increased in size to 128 members, shared equally between Christians and Muslims, rather than elected by universal suffrage that would have provided a Muslim majority (excluding the expatriate community, a majority of which is Christian). A cabinet was established similarly divided equally between Christians and Muslims. According to As'ad AbuKhalil, the agreement greatly diminished the power of the President to the benefit of the Council of Ministers, although there is ongoing debate about whether this power has shifted to the Council as a whole or the Prime Minister. He also noted that the agreement extended the term of the Speaker of the Lebanese Parliament from one year to four years, although the position "remains largely without meaningful authority". The agreement was ratified on 5 November 1989. Parliament met on the same day at Qoleiat air base in North Lebanon and elected President René Mouawad, 409 days after Amine Gemayel vacated this position upon the expiration of his term in 1988. Mouawad was unable to occupy the Presidential Palace which was still in use by General Michel Aoun. Mouawad was assassinated seventeen days later in a car bombing in Beirut on 22 November 1989 as his motorcade returned from Lebanese Independence Day ceremonies. He was succeeded by Elias Hrawi, who remained in office until 1998. ^ Krayem, Hassan. "The Lebanese civil war and the Taif agreement". American University of Beirut. Retrieved 10 June 2012. ^ a b Laura Etheredge (15 January 2011). Syria, Lebanon, and Jordan. The Rosen Publishing Group. p. 151. ISBN 978-1-61530-329-8. Retrieved 19 March 2013. ^ a b Neal, Mark W.; Richard Tansey (2010). "The dynamics of effective corrupt leadership: Lessons from Rafik Hariri's political career in Lebanon" (PDF). The Leadership Quarterly. 21: 33–49. doi:10.1016/j.leaqua.2009.10.003. Retrieved 10 June 2012. 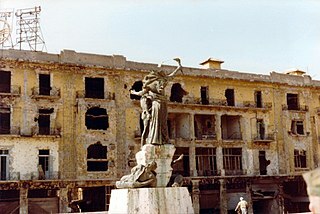 ^ AbuKhalil, Asad (29 May 2001). "Lebanon One Year After the Israeli Withdrawal". Middle East Research and Information Project. Retrieved 7 July 2012. ^ a b F. Salloukh, Bassel (September 2006). "The Limits of Electoral Engineering in Divided Societies: Elections in Postwar Lebanon". Canadian Journal of Political Science. 39 (3): 635–655. doi:10.1017/s0008423906060185. JSTOR 25165996. ^ a b c d Salamey, Imad (Autumn–Winter 2009). "Failing Consociationalism in Lebanon and Integrative Options" (PDF). International Journal of Peace Studies. 14 (2): 83–105. Retrieved 21 October 2012. ^ Somasundram, Premarani (2 August 2006). "Lebanon: Return to the dark ages" (PDF). IDSS Commentaries. Archived from the original (PDF) on 21 February 2007. Retrieved 2 July 2012. ^ Murphy, Kim (25 November 1989). "Lebanon Picks New President; Aoun Defiant". Los Angeles Times. Retrieved 19 March 2013. Rafic Baha El Deen Al Hariri was a Lebanese business tycoon and the Prime Minister of Lebanon from 1992 to 1998 and again from 2000 until his resignation on 20 October 2004. Elias Hrawi was President of Lebanon, whose term of office ran from 1989 to 1998. Selim Ahmed Hoss is a veteran Lebanese politician. He was a Prime Minister of Lebanon and a longtime Member of Parliament representing his hometown, Beirut. He is known as a technocrat. Nasrallah Boutros Sfeir is the patriarch emeritus of Lebanon's largest Christian body, the Maronite Church, an Eastern Catholic Church in communion with the Holy See. He is also a Cardinal. He was elected Patriarch of Antioch for the Maronites on 27 April 1986, and his resignation was accepted on 26 February 2011. He is the third Maronite Cardinal and he was the 76th Patriarch of the Maronite Church with the official title of "His Beatitude and Eminence the seventy-sixth Patriarch of Antioch and the Whole Levant". Bechara El Khoury was the first post-independence President of Lebanon, holding office from 21 September 1943 to 18 September 1952, apart from an 11-day interruption in 1943. He had previously served two brief terms as Prime Minister, from 5 May 1927 to 10 August 1928 and from 9 May to 11 October 1929. Saad El-Din Rafik Al-Hariri is a Lebanese politician who has been the Prime Minister of Lebanon since December 2016. He was also the Prime Minister from November 2009 to June 2011. He is the second son of former Lebanese Prime Minister Rafic Hariri, who was assassinated in 2005. Hariri has also been the leader of the Future Movement party since 2005. He is seen as "the strongest figurehead" of the March 14 Alliance. After three years living overseas, he returned to Lebanon on 8 August 2014 and was designated Prime Minister on 3 November 2016. Hariri's surprise announcement of an intent to resign, broadcast on 4 November 2017 on Saudi state TV, has widely been seen as part of the Iran–Saudi Arabia proxy conflict in Lebanon, and triggered a dispute between Lebanon and Saudi Arabia. The resignation was later suspended, following President Michel Aoun's request to "put it on hold ahead of further consultations". Hariri rescinded his resignation on 5 December. The 2006–2008 Lebanese protests were a series of political protests and sit-ins that began on December 1, 2006, led by groups in Lebanon that opposed the US and Saudi-backed government of Prime Minister Fouad Siniora and ended on May 21, 2008 following the Doha Agreement. The opposition group was made up of Hezbollah, Amal, and the Free Patriotic Movement (FPM); a number of smaller parties were also involved, including the Marada party, the Lebanese Communist Party and the Syrian Social Nationalist Party. The majority of the members of the government were part of the anti-Syrian March 14 Alliance, a coalition of political parties and independents in Lebanon. The two groups were also divided along religious lines, with most Sunnis and Druze supporting the government, and most Shi'a supporting the opposition group. The Christian community was split between the two factions, with Michel Aoun, the leader of the FPM, claiming to have more than 70% support among the Christians, according to the results of the 2005 parliamentary elections. A series of rounds in the Lebanese presidential election were held from 23 April 2014 until 31 October 2016. No candidate reached a two-thirds majority vote in the first round, and subsequent rounds failed to gain a quorum. Finally in the forty-sixth round held on 31 October 2016, Michel Aoun, a Member of Parliament and formerly a disputed Prime Minister and Acting President in a rival government near the end of the Lebanese Civil War, was elected with 83 votes in Parliament. He took office the same day as the 12th President of Lebanon since independence in 1943.